One of my friends is celebrating her 30th birthday tomorrow night and asked me to bring a pie to her party. It is a common cooking/baking practice of mine to double whatever I make so I can freeze or give away the other item. Knowing that my husband loves apple pie, I told my friend I would bake one (and make an extra one). 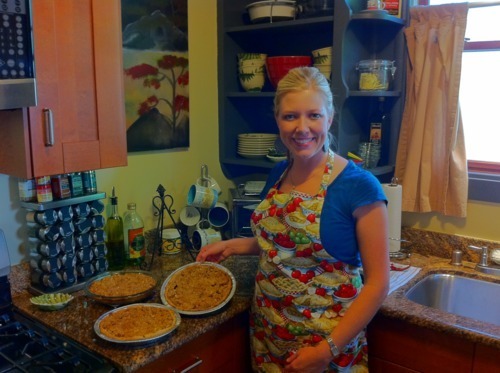 A goal of mine is to make food healthier whenever I can, so I looked for a Dutch apple pie recipe. These pies have a crumble topping and a single crust instead of double. I found this recipe. I doubled the recipe and of course made a few modifications! I used white whole wheat flour from Trader Joe's instead of regular white flour. I used two pre-made crusts from Trader Joe's for all 3 pies. For both the filling and the topping. Also for the topping I used 1/2 cup of butter instead of 2/3 cup and used a mixture of flour and instant oats instead of only flour. The result: delicious smelling kitchen and a very happy husband and friend! 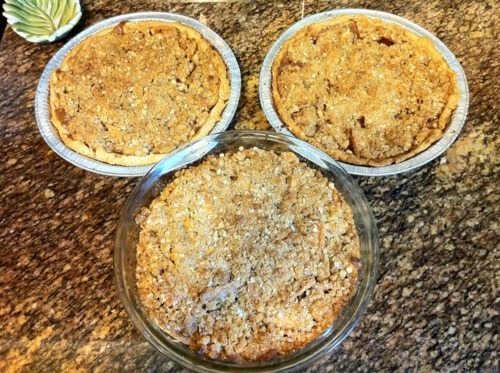 The pies are in the shape of a famous character. Do you know who it is? One of my grandma's bought me this cute apron for my birthday. Considering what I made, I had to take a picture in it. Thank you, Mom-Mom!